Dear Tom, Just wanted to tell you how much we appreciate the job you did on the remodel of our cabinet for our new tv. The name Innovative is certainly a good name for your company because the design you had to do to make the tv fit perfectly took a lot of thought and innovation. Your workmen were prompt and finished on time just as we asked. The fact that you came back and helped out with the install was beyond the call of duty and greatly appreciated. Your vision for the way it would look when it was finished matched what we wanted exactly. I would gladly refer you to my friends and call your first for my next project. Just wanted to say thanks again your efforts made it an easy project to have done in my home. Upon meeting Tom and throughout the process, Tom was very attentive and thorough in explaining our options for our entertainment center. His staff was timely, courteous, extremely hard working and very professional. 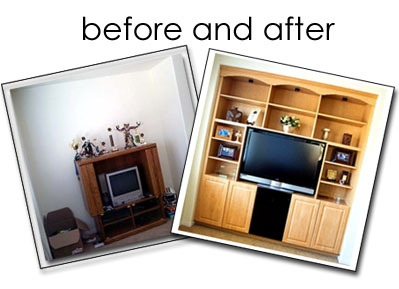 We LOVE our entertainment center and would highly recommend them to friends and family! !